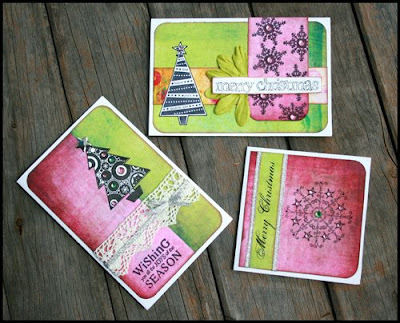 My Creative Existence: Christmas Cards! Boy oh boy have I been a busy bee lately. Not much crafty stuff going on though! However, I did have some time to create these Christmas Cards for the Scrapbook Savvy newsletter. 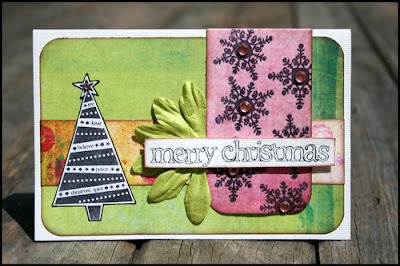 I have used papers from the gorgeous Fancy Pants "Happy Holidays" range that you can get from Scrapbook Savvy. I have also used stamps from the Kaisercraft "Merry Christmas" acrylic stamp set for all my cards. 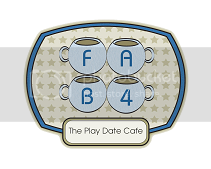 Just a very basic design - quick and easy (and cost effective) to make if you have lots of cards to send and little time! The "Merry Christmas" is a rub on from the Kaisercraft "Christmas Cards" B&W rub on set - it has so many greetings on it - 1 packet will be enough for all your cards. I've used just the one stamp, directly on the card, to keep it quick and easy. I then added a touch of sparkly ribbon and some Kaisercraft bling to jazz it up a little. I have used 2 stamps on this one. The greeting was stamped directly onto the card, whilst the tree was stamped onto white cardstock. I cut around the image and adhered it to the card front. Again, some Kaisercraft Rhinestones add some sparkle, and a metallic star shaped brad tops the tree. 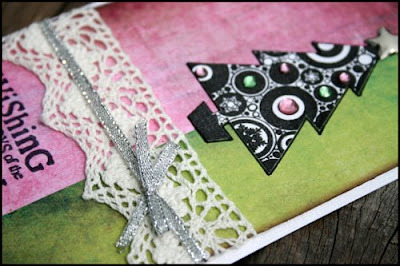 I have added some lace around the card front, and tied a sparkly silver ribbon around the middle for some added interest. This one is the most difficult to make, and requires the most time. Great if you have just a few cards to make for those extra special people. This time I have used 2 of the Christmas stamps, plus a different "Merry Christmas" rub on. 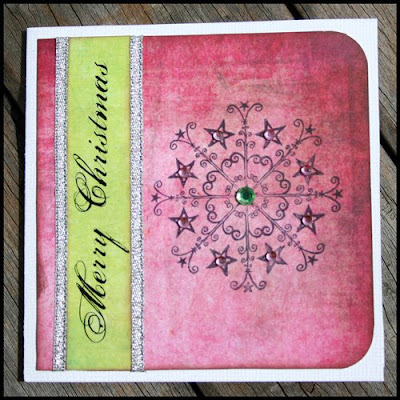 I created a patterned background using the pink paper and the snowflake stamp. 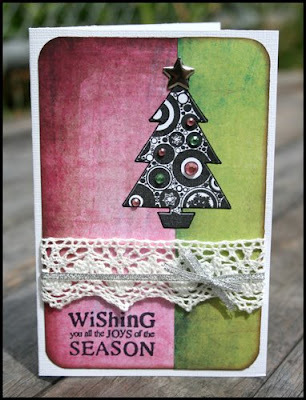 Next, I stamped the Christmas tree onto white cardstock, cut it out, and added it to the card. I then attached half a green flower, then the "Merry Christmas" greeting was mounted on to the card with foam mounting tape. Again, some Kaisercraft bling to jazz up the snowflakes, and as a star on top of the tree. Check out the Scrapbook Savvy Christmas Shoppe for some great Christmas supplies - you'll even find selected Christmas goodies at 30% off until the 30th November 2008.